Should parents permit late night cram sessions? 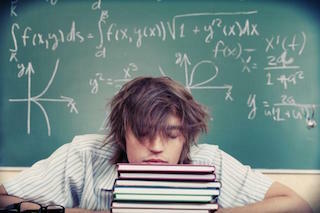 Home » Blog » Should Parents Permit Late Night Cram Sessions? It’s final exam season, and for many parents, that means doing whatever they can to either support or discourage their kids’ late-night cramming. But a lot of parents are left in indecisive state, wondering which stance to take. We want our kids to perform well on their exams, but should we allow them to engage in unhealthy behavior that could become habit? As we’ve blogged before, it is possible to make up for the lost sleep later, but only to a certain extent. The longer students deprive themselves of the sleep they need, the harder it is to make up for lost z’s. And over time, this sleep debt will build until the body begins to break down from fatigue, which can then lead to serious health problems, such as heart disease, high blood pressure, and diabetes. But, there’s more than sleep deprivation to worry about. To keep their energy up, it’s becoming increasingly common for students to turn to coffee, energy drinks, NoDoz tablets and other energy boosting products, which can result in serious health issues. In some cases covered heavily by the media, the overreliance of these products proved fatal. A parent may think, it’s just for a few days. But over time, late-night study sessions could become a matter of course, creating lifelong habits that could eventually become dangerous. And we’re not just talking about college students or even high schoolers. Between 2010 and 2013, of the more than 5,000 cases of sickness caused by energy drinks, 40% occurred among children aged six or under. There’s another reason why parents should reconsider letting their kids pull all-nighters: studies show they simply don’t work. UCLA professor of psychiatry Andrew J. Fuligni, for one, found that sacrificing sleep for late night study sessions is counterproductive. Not only does memory retention tend to require consistent study schedules over time, but sleep deprivation can also lead to lower test performance. Our bodies simply require adequate sleep to function at their fullest. And if energy boosting products are added to the mix to get things moving, there’s the inevitable crash that can bring those bursts or productivity to a grinding halt. 1. Encourage kids to forgo energy products in favor of natural energy-boosting foods like whole grains, nuts and fruit. 2. Have them take a nap. Even short power naps of 20-30 minutes can have enormous benefits. 3. Suggest experimenting with different study schedules. Instead of long late-night sessions, kids can try getting up early when they’ve got more energy. 4. Have kids take more productive breaks. Video games can chew up more time than intended. TV will make them sleepy. A brisk walk or a quick pep talk from a friend is better. 5. Make sure they’re eating right, exercising and getting the sleep they need regularly. When it comes to peak performance, healthy bodies work harder and do better than the unhealthy ones.